All obituaries are submitted and edited by families or funeral homes. Charles Robinson Adams, 75, retired Quaker minister, formerly of Archdale, NC, entered into eternal rest on Thursday, Jan. 3, 2019. In addition to his parents, preceding him in death were a daughter, Dr. Samantha Adams Berden, and a brother, Thomas Adams. Charles was born on March 10, 1943 in Guilford County, to the late John Thomas and Jewell Jones Adams. He was a 1961 graduate of Allen Jay High School, received his bachelor’s degree in political science from UNC Chapel Hill and his Master of Ministry from Earlham School of Religion in Richmond, Indiana. His 43 year ministry career consisted of: Christian Education Director at Sugar Plains Friends Church in Thornton, Indiana, then at First Congregational Church in Fort Lauderdale, Florida; Youth Pastor at High Point Friends; Pastor at Mt. Airy and Deep River Friends Meetings. He moved to Plant City to be near his aging father and for the past 10 years enjoyed attending First Baptist Church of Plant City. Charles enjoyed his 50 plus years singing in gospel quartets. He was a registered white-faced clown named ‘Charlie’ and enjoyed baking and reading. Charles is survived by his granddaughter, Jadzia Berden, son-in-law, Patrick Berden, stepsons, Jason Hill and Jeff Hill, and their mother, Judith Winslow, step-grandchildren, Reece Hill and Kalahan Hill, sister-in-law, Linda Kinley Adams. A service was held to celebrate Charles’ life Saturday, Jan. 12, at Providence Friends Meeting, 2054 Providence Church Rd, Pleasant Garden, NC, with Pastor Kevin Rollins officiating. Interment followed in Guilford Memorial Park Cemetery. In lieu of flowers, memorials in Charles’ memory may be made to the Jadzia Berden Education Fund and contact information for that fund will be available later on Charles’ webpage at www.cumbyfuneral.com. Cumby Family Funeral Service of Archdale is in charge of arrangements. Dora Jean Hickman, 77, of Plant City, passed away on Jan. 8, 2019. In lieu of flowers, donations may be made to Lifepath Hospice. Helen Voncele Polston, 83, of Plant City, passed away on Jan. 10, 2019. Jakelin Espitia, 11 dias, nacio el 3 de Enero del 2019 en Tampa, entro en descanso eterno el 14 de Enero del 2019. 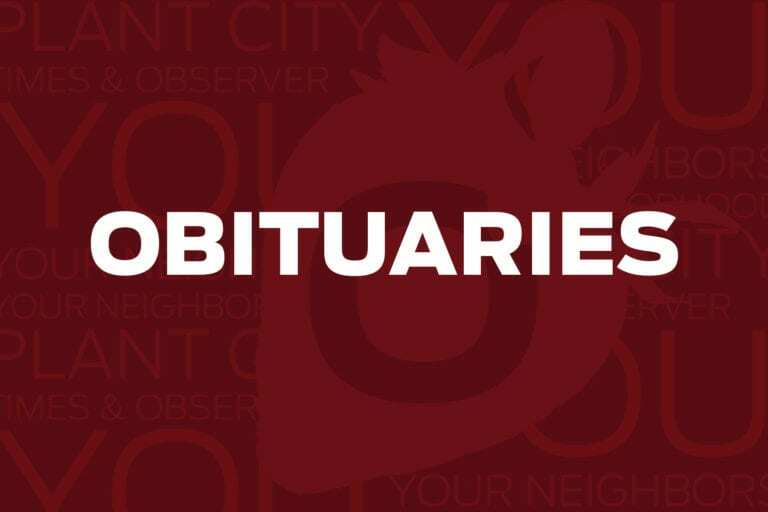 Luis Guzman, 69, of Dover, passed away on Sunday, Jan. 13, 2019. Funeral services will be held at 1 p.m., Thursday, Jan. 17, 2019 at Wells Memorial. Visitation will be held one hour prior, from 12 p.m. to 1 p.m. at the funeral home. Cynthia P. “Cindy” Williamson, 65, of Dover, born in Plant City on Sept. 3, 1953, entered into eternal rest on Jan. 13, 2019. Marcella Jones, 86, of Plant City, passed away on Jan. 12, 2019. Born in Lake Worth. The family will receive friends Thursday, Jan. 17, 2019 from 5:00 p.m. to 6:00 p.m. at Shiloh Baptist Church, 905 West Terrace Drive, Plant City, FL 33563. Funeral services will follow at 6:00 p.m.
Jimmy Doyle “JD” Faught, 78, of Lake Wales, born in Cooter, Missouri on Oct. 9, 1940, entered into eternal rest on Jan. 13, 2019.